Google has removed its official Gmail for iPhone, iPad and iPod touch app, just hours after launch, following a huge backlash from disappointed users. The long-awaited app arrived on Wednesday afternoon and was greeted with howls of derision from iOS device owners claiming the app was buggy and unusable. Google responded by pulling the app from the App Store, promising to restore it as soon as it fixed the bugs. "Unfortunately, it contained a bug which broke notifications and caused users to see an error message when first opening the app," the company said. "We've removed the app while we correct the problem, and we're working to bring you a new version soon. Everyone who's already installed the app can continue to use it." Those who have already downloaded the app will continued to be able to use it, but for now there's no new downloads until Google fixes it. Perhaps a top to bottom overhaul would do the trick? 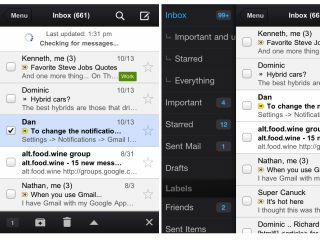 The official Gmail for iOS app had promised to bring push notifications, auto-completion of email addresses, efficient search and Priority Inbox to Apple's iOS devices. Those features are all there, but the ability to use them is conspicuous by its absence.